Admission to the University does not constitute acceptance into the Social Work major. Interested students must apply and be accepted as social work majors. The Social Work department only accepts social work applications one time a year, due on December 7th. Choosing to major in social work is an important professional and career decision which requires learning about social work as a profession, self-awareness and value clarification, and informed decision-making. As students think about choosing a major, they should be exposed to the profession of social work, career opportunities, and challenges. Our department requires that students engage in self-awareness and examine their motivations for becoming a social worker. In order to facilitate this process, students who wish to major in social work must complete the “Application to the Social Work Major” process (see below). Note that this process is also your application for Field Education, it is a single application for both aspects. The process begins when interested students take SWK 215, Introduction to Social Work, where they learn about the profession of social work and social work practice. Students are exposed to concepts and definitions of social work, the relationship between social problems and social work, fields of practice, and job opportunities. Students also complete a 25 hour volunteer experience in a human service agency. In addition, students must complete an essay as part of the course requirements. This essay assists students to synthesize their knowledge about social work while also examining their personal interest and motivation for a career in social work. See the Suggested Plan of Study (pdf). Have any general questions about majoring in Social Work? Completed SWK 215 with a minimum grade of C *. A minimum University GPA of 2.5 and completion of 51 semester hours. Submitted a complete application package (see below). *Transfer students who have completed the equivalent of SWK 215 at another CSWE-accredited BSW program will still need to complete the essay in order to apply for admission. Contact the BSW Director for essay guidelines. For an overview of how to apply to the Social Work Major,consult this PowerPoint (ppt). Please note that this application serves to apply for both the BSW Major and for Field Education. Please ask your references BEFORE you list them. The deadline for applications is December 7th. Students should submit their completed application online. Admission to the social work major is competitive and limited. Applicants will be notified in writing concerning the admission decision. During your final (senior) year of the social work program you are required to be a full-time student. The UNCG social work program is not a part-time, evening or online degree program. During your final year you will be expected to be in a Field Placement 16 hours a week (generally on Tuesday & Thursday), Seminar course every other Wednesday morning, and a Methods course each semester, along with a 500-level social work elective. This is in addition to whatever other courses you may have to complete to graduate. Wineburg's Web: a feature on Dr. Wineburg's career, impact, and influence! Dr. Daniel Rhodes on the importance of Peacemaking Circles and the Summit Avenue Apartments. JMSW Student Courtnee Powell receives the University’s Award for Outstanding Junior Graduate Research Assistant! Dr. Meredith Powers has been named a Sustainability Faculty Fellow of 2019-20! Social Work Department and the HHS Day of Gratitude! Students and Faculty engage in the NC-NASW Advocacy Day! Dr. Wineburg interviewed by UNCG Special Collections and University Archives! Dr. Meredith Powers and Dr. Cathryne Schmitz will participate on a panel discussion, "Peace, Social, and Environmental Justice: Writing of Peace and Conflict Studies and Social Work Faculty at UNCG" on February 21 at Scuppernong Books! 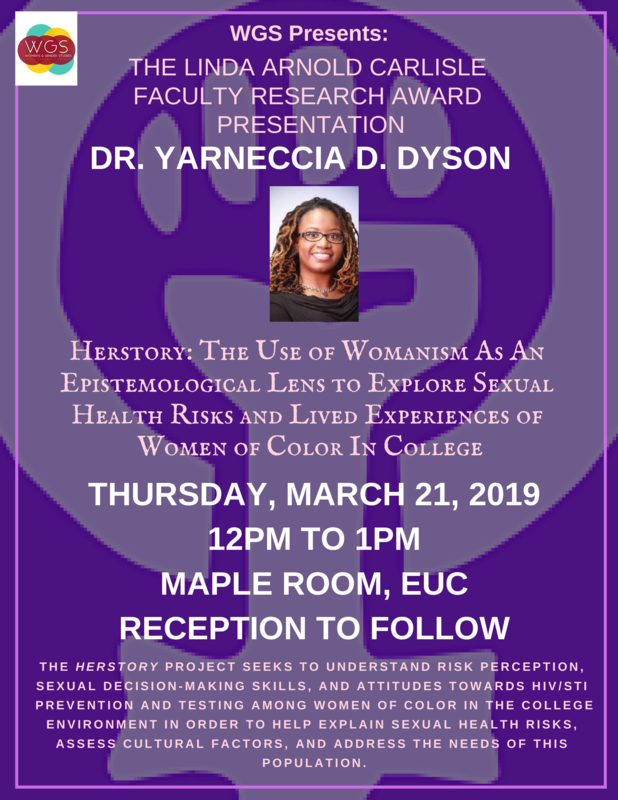 Dr. Yarneccia d. Dyson will present "Herstory: The Use of Womanism As An Epistemological Lens to Explore Sexual Health Risks and Lived Experiences of Women of Color in College" on Thursday, March 21! Dr. Rebecca Adams interviewed for "15 Years of Facebook Friendships." Read about GCSTOP's impact on opiod deaths less than a year since inception! "The catalyst: Lelia Moore made the most of opportunities to benefit the most vulnerable in Guilford County." Click to read about her influence on the Congregational Social Work Education Initiative! Dr. Meredith Powers was featured in the NASW NC Newsletter on environmental justice and the recent impact of hurricanes on NC communities! Civil Rights, Food Justice, and Climate Change Event on Monday, November 12th! Read about Dr. Tyreasa Washington's visit to UKZN's Social Work Department! Job Announcements for Joint Doctorate in Social Work Program! Click here to sign up for one of the Fall JMSW Information Sessions! Dr. Yarneccia D. Dyson wins the 2018-2019 Linda Arnold Carlisle Research Grant! The Fall 2018 BSW Field Calendar (PDF) is now available! Dr. Meredith Powers receives funding from The Junior League of Greensboro for the project “Parks for All People: Promoting Health and Wellness by Engaging Aging Populations in Public Parks." Dr. Yarneccia D. Dyson appointed to CSWE Leadership Position! Dr. Yarneccia D. Dyson named one of the 2018 Faculty First Awardees for her study: An Examination of Psychosocial and Environmental Factors As Predictors of Risk for HIV in African American College Students enrolled at HBCU’s and MSI’s! UNC Sytem Board of Governors Approves New Joint PhD in Social Work! Dr. Jay Poole received new funding from Cone Health Foundation for the project “College Park Clinic." Dr. Tanya Coakley's "Barbershop Talks" is featured on WFMY News2! Dr. Tanya Coakley's work on how black men talk to their sons about sexual health is featured on NPR! Dr. Danielle Swick received new funding from the North Carolina School-Based Health Alliance! Chase Holleman, a 2016 BSW Graduate, is the 2018 NASW-NC Advocate of the Year Recipient at the Front of Opioid Epidemic! JMSW student Sarah Hamrick receives the 2018 NASW-NC Presidents’ Award! To see archived news, please click here.